Sentinel for dogs provides protection from fleas, heartworms and other parasites. Your dog will flip, fly, and slip on the tile floors trying to get at these delicious chewables whenever monthly treatment time comes back around. This makes treatment not only easier than regular topical medications, but a lot more fun for you and your dog. Should this be used in conjunction with Heartgard Plus? Yes you can use it with Heartgard. Yes, it is safe but please consult your vet first as some breeds might react differently. Does this kill adult fleas? Is it compatible to Nexgard? Whats better for fleas i have 4 small dogs weight from 11.25lbs up to 16.35lbs. ? Yes it does kill adult fleas. You do not need to use this with Nexgard. They pretty much do the same thing. You can use either ine of them. Nexgard is a newer product from a different manufacturer. Thanks for inquiring Fanny! We do not sell Trifexis anymore. Sentinel Spectrum Properties as requested: Milbemycin oxime, praziquantel and lufenuron are the active ingredients in Sentinel Spectrum Tasty Chews. Milbemycin oxime interferes with nerve transmission in invertebrates, which helps protect against heartworm, roundworm, hookworm and whipworm (minimum dose rate: 0.5mg/kg). Praziquantel causes muscle spasm in tapeworm, which are then attacked by enzymes and disintegrate (minimum dose rate: 5mg/kg). It kills all intestinal forms of tapeworm except Spirometra spp, which require a higher than standard dose rate. Lufenuron is an insect growth regulator that interrupts the flea breeding cycle. 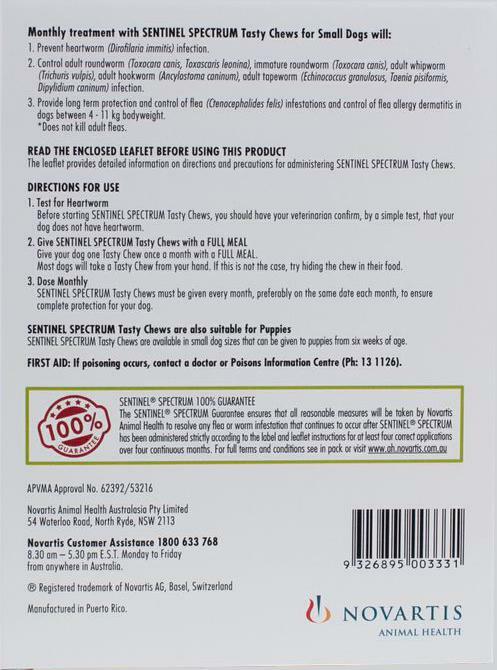 Adult fleas that feed on an animal treated with Sentinel Spectrum will produce eggs or larvae that do not develop to the adult stage. Therefore reducing the number of fleas in the environment. Sentinel Spectrum Tasty Chews are beef-flavoured, and studies have shown they are so palatable that 97% of dogs accept them straight from the hand. Unfortunately Sentinel does not prevent Ticks. It's best to check with your vet to see if your pet is ok to combine products, however we recommend Advantix for Tick prevention and I personally use both together. Sentinel spectrum covers free amd heartworm both. And my dog is kingchars spaniel. And her breed has weak heart. So this item is essential for her.